First up, we have thre checklist cards. When I was a kid, my friends and I would trade based on the names on the checklist. If the checklist had star players, it was 'worth' more in a trade. Looking back, it was a rather idiotic way to trade for cards, but it worked for us. We were kids, remember, and back then we had no real perception of 'value' other than by the fame of the player listed. Now, here we have two great Tribers and one that could become a great Triber (assuming he's still with the club), even though he was involved with the Lee deal to Philly. I'm not saying he had anything to do with it, just saying he was involved. 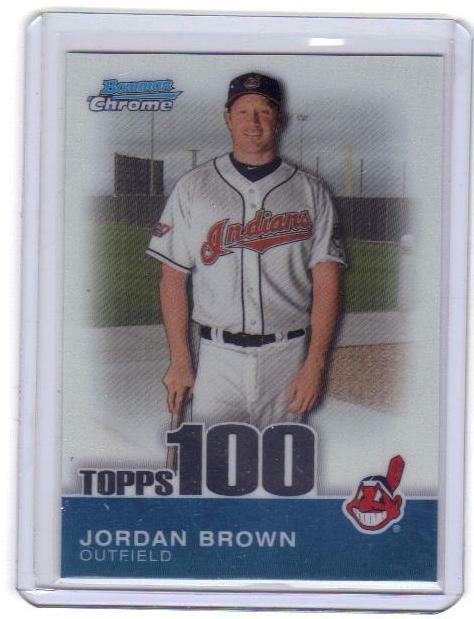 Jordan Brown has the unfortunate situation in that he shares his name with a 12-year old boy who was arrested for killing his father's finacee'. Aside from that, he played in 88 games last year and finished with a .230 average. The card is a serially numbered Topps 100 and is oh so shiny! There were a LOT of duplicates of these guys in the break. That's good news for fellow Tribecards fans that will be getting a little something extra in their stockings this year from yours truly. Everyone that took part in the break got one of the USA cards (er, so I believe). I also managed to snag a REDEMPTION card! I cashed it in and should be receiving my auto'd card in... 12-to-15 weeks. Wow. That puts it arriving roughly... February 2011. I hope I remember where I got it when it comes then!